The peninsula of Florida was once considered a vast wilderness filled with lowlands, swamps and marshes. People from many regions have come over the years envisioning paradise and have made it their goal to make sure Florida was a wonderful haven. The Spanish explorer Juan Ponce de León arrived in 1513 to this peninsula and called the region La Florida, roughly translated as Land of the Flowers. By 1565 the Spanish had started colonizing the area and it remained in Spain’s possession until 1763. Over those years great progress was made, especially with the establishment of St. Augustine in 1564 along the northeastern coast. Not only was the entire peninsula, but also the southern regions of Alabama, Louisiana and Mississippi were considered part of Spanish Florida. The French Huguenots had tried to establish a colony in 1564 at Fort Caroline near present-day Jacksonville. However, the Spanish destroyed the fort and drove the French out. To keep a strong hold on the Florida peninsula, additional Spanish colonies were established on the east and west coasts of Florida. They were on continual guard during the 1600s from the French who had established themselves further west along the Louisiana region and the English going north along the areas of Georgia and the Carolinas. Spanish forts and settlements had to be strong along the Gulf Coast especially at present-day Pensacola. In the 1700s there were periods of peace and times of conflict between the French, Spanish and English. Spain had sided in 1761 with France in a conflict with England and lost. In a treaty of 1763, Spain ceded all the land of Florida to England. This British colonial period for Florida ran from 1763 to 1783. The British holdings went from the Atlantic Ocean side west across Florida to the Mississippi River, making a West Florida and East Florida. New English settlements were encouraged to hold Florida by gifts of land to those who would come to live permanently. Florida became a safe haven for those in support of England during the American Revolutionary War. With the British lost in the American Revolutionary War, Spain was able to reclaim West and East Florida and held the region from 1784 to 1821. Spain encouraged and assisted slaves who had run away from northern states to resettle in Florida. The new United States then had disputes with Spain over the northern Spanish border of Florida. It would be after the War of 1812, when pressure was placed on Spain to give up the Florida lands because so many Americans from the states north of Florida wanted to move into the peninsula. Finally by 1821, a treaty was signed and Spain gave up West and East Florida to the United States. 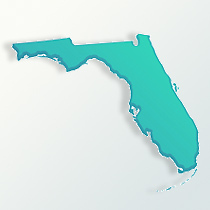 As a new territory of the United States, Florida had nearly 35,000 people as residents by 1830. Once the European countries’ influence was out, the United States next had to deal with the native Indians, the Seminole tribes of Florida. The tribes (Yamasees, Creek, Mikasuki, Choctaws and Yuchis) were composed of native Indians from other regions who had moved south. There were three separate Seminole Wars in the peninsula, running 1817 to 1818, then again from 1835 to 1842 and the final war was from 1855 to 1858. By 1858, some 3,824 surviving Seminole Indians and blacks (who had intermarried with the Indians) were relocated to Arkansas and the Oklahoma Indian Territory. However, there had been over the years great losses in property and lives on the part of the Indians, soldiers and civilians. A small handful of Seminoles families managed to escape Federal troops and hide deep in the Everglades. Florida became the 27th state of the United States on March 3, 1845 with a population of about 66,500 residents, mostly in the central to northern sections of the state. With the Indian wars settled, a steady small stream of new settlers, especially from Alabama, Georgia and the Carolinas, came to live in Florida during the 19th century. The greatest surge of newcomers came in the 1920s and then again after World War Two. People from the far northern states loved the idea of a year-round warm climate, causing the population to increase by tremendous figures. In Florida genealogy an interesting note it would appear that few Floridians today are natives, but actually there are over 1,500 lineages with families dating back before statehood in 1845. A major influx of citizens from the island nation of Cuba fled their homeland to live in Florida around 1960 and continued arriving for some thirty years. They had hoped they could return one day, once the communist government no longer existed in Cuba, but by the 21st century that has not happened. The ethnic and cultural favor of South Florida and the Tampa area on Florida’s west coast have greatly changed over the last several decades of the 20th century. Mixed with that were the people leaving other Latin American nations; like Haiti, the Bahamas, Dominican Republic, Venezuela and Honduras to live in South Florida. Across Florida there is a mixture of cultural heritages, ranging from the Greeks in the Tampa area, to Germans in Southwest Florida and major Jewish communities in South Florida. The term ‘Florida Crackers’ refers to those descended from the old pioneer families, especially in North Florida. These original white families are of English and Scots-Irish heritage. Going from a population in the state of 525,000 in 1900 to 18.5 million in 2009 is quite a massive migration. The largest jump in population came in the 1950s when it increased by 79 percent. Those of German decent make-up about 12 percent and the Irish about 10 percent, with most coming from the mid-west and northern states. Since 1513, the Florida peninsula had been under the control of four nations; Spain, France, England and the United States, each contributing their own cultural influence for Florida genealogy. Added to that mixture are the numerous immigrates from the Caribbean, Central and South America.